The ‚Rosalie Moller‘ was originally launched in Glasgow in January 1910 as the ‚Francis‘. For her time this was a very modern ship with a 3-cylinder steam engine with a top speed of 10 knots with 4 holds. In 1931 she was sold to the ‚Lancashire Moller‘ line and she was renamed the ‚Rosalie Moller‘. Until then, she had only sailed in American and British waters. The Moller’s had other plans with her and she quickly maintained a connection between England and China, in the ports between Shanghai and Tsingtao. Like many other ships, many ships were confiscated by the British Ministry of Transport at the outbreak of the Second World War. Because she was 30 years old and her top was only around 7 knots, she was first deployed around England to support the British economy as good and as bad as that, especially with the transport of coal. Her machines were kept on the go with art and flight work. Many sea ships, including the warships, were coal-fired steam ships at the time. Due to lack of faster ships, the slower ships were moving further and many trips had already been made to Gibraltar and even to Malta to unload the coal that was very important for the war. At the end there was no more repair possible and the Rosalie Miller was thoroughly refurbished in July 1941 and she got her what appeared to be her last destination. She was loaded with almost 5 tons of coal and was instructed to sail via the Cape of good Hope to Alexandria. She arrived in the Red Sea on 11 September and was sent to ’safe anchorage H‘ to wait for the signal that she was allowed to come in to unload. 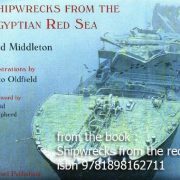 Because two ships had a collision in the Gulf of Suez, it took two weeks. Not only for the Rosalie Moller, but also the ‚Thistlegorm‘ with its valuable cargo were waiting but anxiously. The downfall of the ‚Thistlegorm‘ was also the reason for the downfall of the Rosalie Moller. The German pilots also saw the ‚Rosalie Moller‘ because of the great blast and accompanying fireball of the ‚Thistlegorm‘. Partly because of this unexpected success, the two Heinkels came back the next night especially for the Rosalie Moller. Two bombs were released which ended up in cargo hold three. On October 8 at 00:45 the ‚Rosalie Moller‘ disappeared under the waves. 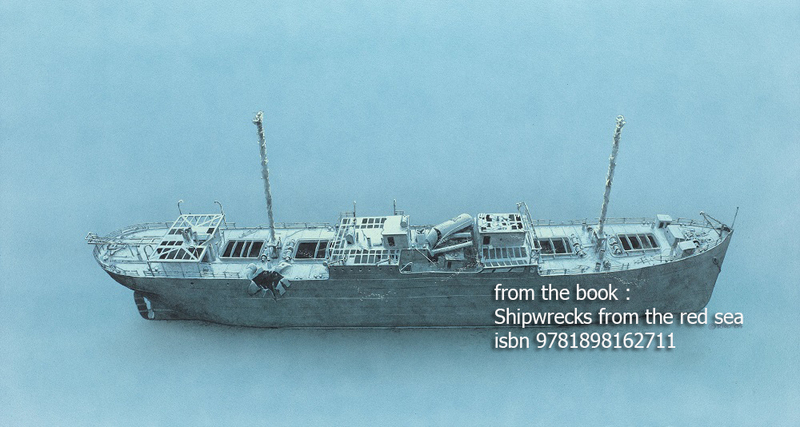 The ‚Rosalie Moller‘ is truly a beautiful wreck. She stands upright on the seabed and precisely because she is standing upright she could withstand the forces on her body better. Therefore, the hull is still completely intact. One problem for diving is the depth. The seabed is almost 50 meters so her deck is between 32 and 35 meters. Remarkable is that things like the railing and such are still largely intact. There is also little debris on deck. Of course, the wooden deck hatches are gone but in the holds the coal can still be found. The chimney, still standing proudly until 2001, has collapsed. Unfortunately, due to pure vandalism. This also applies to the rest of the Rosalie Moller. The chimney is the marking point for the entrance of the engine room. However, pay attention to this. The machine is equipped with walkways. It is very easy to go deeper into the engine room but also because of sediment it can be very difficult to find the right way back. This way, several divers have died. So, enjoy the exterior of the engine room and the decks but do not enter unless you are specially trained to do this. Also keep an eye on depth and air consumption. It is very easy to exceeded diving times or use more air than the you had planned. The ‚Rosalie Moller‘ is especially famous for its large schools of glass fish. These normally live more in the shade, but given the depth of the wreck and the often-poor visibility, they apparently enjoy it very well. Also, because it is a deeper wreck you can often find larger fish species such as the Sea Bass or large groupers. Jacks and Tuna are normally circling around the wreck, which never safety or decostops never boring.